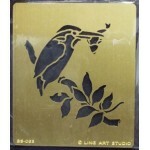 Kingfisher metal stencil. 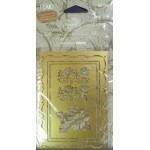 7 x 8 cm .. 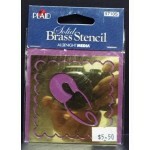 Plaid Plastic embossing stencil. 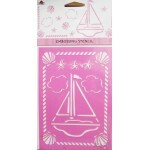 Size : 18 x 13 cm .. 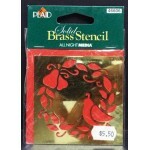 Plaid metal stencil - Bird and wreath 3 x 3 inch's .. 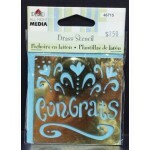 Plaid metal stencil - Congrats 3 x 3 inch's .. 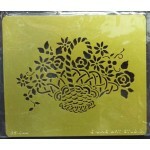 Flower basket metal stencil 8.5 x 7 cm .. 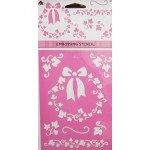 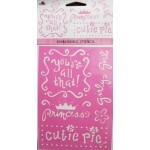 Plaid plastic embossing stencil Size : 18 x 13 cm .. 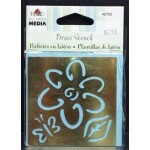 Plaid metal stencil - flower, butterfly & leaf 3 x 3 inch's .. 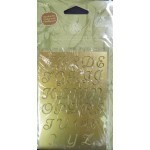 Plaid Anna Griffin metal stencil Size : 5 x 3.5 inches - each letter approx .5 inch high .. 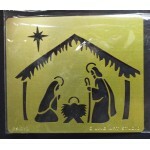 Plaid metal stencil - nappy Pin with border 3 x 3 inch's ..
Nativity scene metal stencil 8.5 x 7 cm ..